Appearance: Medium height and build with slick black hair, light skin and cool blue. Distinguishing Feature: Deranged tear ducts in the left eye causing him to weep blood. Organisations & Alliances: Quantum, Dimitrios, Valenka, Mollaka, Carlos, Mr. White, Kratt. "You know, I never understood all these elaborate tortures. It's the simplest thing... to cause more pain than a man can possibly endure." Without his clients' knowledge Le Chiffre gambles with their funds, shorting on stocks for a major new airline, Skyfleet Enterprises. The dark brooding character is armed with platinum asthma inhaler and an evil eye for cards. He is a cold and friendless man who once commanded a powerful entourage but has lost credibility in recent years of his life and is struggling to keep on top of his game. When his gambles go sour, Le Chiffre has one last shot at recouping his clients funds. He stages a high-stakes poker game at Casino Royale in Montenegro in order to win back the lost funds. MI6 is keeping tabs on the villain and sends James Bond, the service's best poker player to beat Le Chiffre at his own game. His only hope to save face (and his life) with the mysterious organisation that has backed him to date is to face James Bond at the poker table. When Le Chiffre is narrowly beaten by 007 at the table, this game becomes much more lethal and James Bond and this evil arch-villain commence a vicious game of cat and mouse - involving kidnapping and a brutal torture. 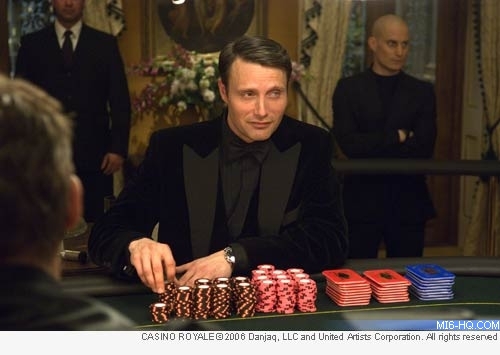 Bond and Le Chiffre come face to face over the poker table, where the villain expresses faux curiosity over 007's cover identity by exclaiming "Mr. Beech... or is that Bond? I am a little confused." Le Chiffre operates out of a luxury yacht that allows him to meet anywhere from sub-Saharan Africa, to the Mediterranean. The villain regularly hosts high-stakes poker tournaments onboard but gives the his guests a rude send-off when business crops up. The banker wants for very little, from cars to boats but his only trinket is an obscure asthma inhaler. Smartly attired in unadventurous black suits, Le Chiffre's dress code is conservative. His trademark is a jet-black bow tie. With 007 trussed up by Le Chiffre in the depths of an abandoned ship at the Montenegro harbor, Le Chiffre is coldly assassinated by Mr. White, the middleman of shady organisation that had been passing the banker work. Luckily for Bond, White spares both him and Vesper Lynd. Mads Mikkelsen was born in Copenhagen, Denmark and began his career in the entertainment industry as a dancer. After graduating from the Arhus Theatre School, Mads appeared on stage in Lars Kaalund's rendition of Romeo and Juliet. Mikkelsen first appeared on screen in 1996’s "Pusher" but has since starred in Susanne Bier’s "Open Hearts" and picked up a Robert award (a Danish Academy Award) as well as a Bodil (Danish Film Critics’ award). More of Mads’ film credits include: "I Am Dina" opposite Gérard Depardieu and more recently in Hollywood, Mikkelsen starred opposite the superstar Clive Owen and British beauty Keira Knightley in "King Arthur". In this Antoine Fuqua new take of an old legend Mad’s portrayed Tristan, one of the round table knights. Post Casino Royale, Mads joined the cast of "Valhalla Rising", the action/adventure released late 2009. He also played Igor Stravinsky in the semi-autobiographical "Coco Chanel & Igor Stravinsky" (2009). He later played opposite fellow Bond star, Gemma Arterton in "Clash of the Titans" (2010). Mads married choreographer Hanne Jacobsen in 1987 and the couple currently has two children, Viola and Carl. "I have a bad eye, a baddies eye!" "I liked this role! He's a vain guy, he likes to dress up nicely. I definitely like this character." 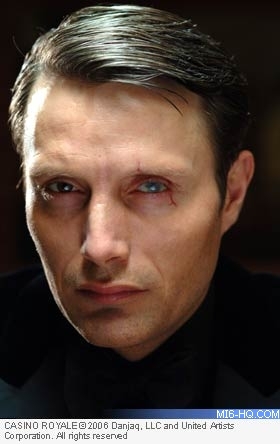 "[Le Chiffre] is just like everybody else in the world because he’s trying to get rich. And that makes him a better villain."